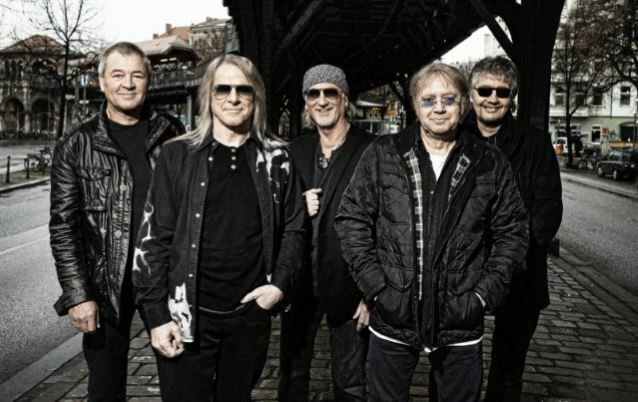 DEEP PURPLE's new CD was recorded earlier this year at a studio in Nashville, Tennesse. The follow-up to 2013's "Now What?!" album is once again being helmed by Bob Ezrin, who has previously worked with KISS, PINK FLOYD, PETER GABRIEL, ALICE COOPER and KANSAS, among others. DEEP PURPLE bassist Roger Glover recently talked about the band's writing process, telling Ultimate Classic Rock: "We jam and jam and jam, and if we find something that we like to play or that works well or inspires us, then we'll try to knock it into some kind of arrangement. Then, once we've got that, Ian [Gillan, vocals] and I will figure out what the song's really all about, and write the lyrics and all of that stuff." "Now What?!" sold 4,000 copies in the United States in its first week of release to debut at position No. 115 on The Billboard 200 chart. The album was released in North America in April 2013 via earMUSIC, the Hamburg, Germany-based international rock label which is part of Edel Group.